The Visser Collection, collected over a period or more than thirty years, was the finest and largest concentration of small arms, fabricated in the Low Countries. This collection has been meticulously described in two monumental volumes, which were published in 1996-1997. The Visser Collection, collected over a period or more than thirty years, was the finest and largest concentration of small arms, fabricated in the Low Countries. This collection has been meticulously described in two monumental volumes, which were published in 1996-1997. This book is the fourth and last part of Volume I, and describes over 350 rare and special firearms, swords and related objects, from the 16th to the 19th century. 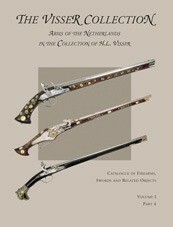 Guus de Vries is a historian, specialising in the field of firearms. Thus far, he has written fifteen books on firearms history, mostly together with Bas Martens, and numerous articles for magazines in Belgium, Germany, Finland, the Netherlands, Russia, the United Kingdom and the U.S.A.